Part Two: Masonry: Who Is It For? I believe that societies such as those of Poland, or Czechia, or Slovakia, or Hungary, the Ukraine, or Bielorussia — societies which have, to a lesser or greater degree — some to a very small degree, some to a much larger degree — released themselves from the ballast that came with the Communist system, are now looking for some other way. What is needed is a new understanding of society, a new form of social harmony founded on principles different from those of the past. Conflict divides people, which raises the question: what can bring them together? What can be done to glue together this shattered pitcher? 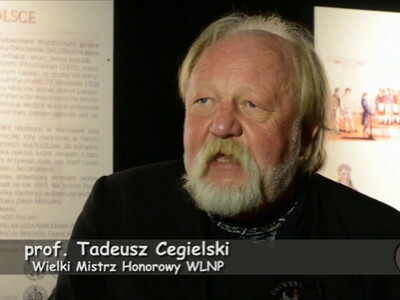 In the 1990s, especially, I recognised the necessity of the existence of Freemasonry in a country such as Poland, because on the one hand we have this old social layer which ruled the spirit as well as the mind, and another new layer that we can refer to as the middle class or the bourgeoisie. Whatever we call it, it certainly exists, and all of us know it very well. There is an entirely new group of people who arise from the intelligensia, who have academic titles. But they are no longer members of the intelligensia, they do not represent the way of thinking that characterises the intelligensia, and the gap between them and the old group that ruled the spirit and mind has become enormous. Thus it was that in the 1990s, lodges became, and continue to be, a place where these different groups could meet one another, where people could meet. And I was always delighted to see the ice beginning to melt, how the people bristling with titles, the doctors, the habilitated doctors, grew to accept those younger than themselves, those who had, of course, completed their education but were now involved in one business or another. People, for certain, need some form of spiritual nourishment. It has always been so, everywhere. Freemasonry has always provided such a form of spiritual nourishment. On the one hand it provides a fellowship, a comradeship, on the other a spiritual nourishment for a new generation that hungers for ritual and values. Some find these values in churches or other denominations existing in Poland. Others do not. They do not find the values they seek. And sometimes, by no means always, they turn to Freemasonry and begin to develop an interest: to listen, to read, and to consider whether that which Freemasonry offers is for them or not. Whether the gentlemen in aprons are not just a funny relic of the past, but can offer something to younger, more athletic, more elegant people.